Majora’s Mask is commonly called a dark Zelda game, and by many it’s considered to be the darkest of them all. I’ve made no secret of my love for the game, and I’ve also made no secret of the fact that I do not truly think the game is dark at all. In most discussions about Majora’s Mask’s darkness, I’ve vehemently defended the game. That is not to say that it being dark is actually a bad thing, because dark stories are fine, but in the case of Majora’s Mask I find that claiming the game is dark is actually an oversimplification of the game’s themes. Both the dark and light moments of the game have far more to them than most people acknowledge, and in this article I’d like to discuss them. I’m going to address three major areas of the game and discuss them in order to show and hopefully convince you that they are not dark, overall, when all is said and done. Virtually every game ever made has dark moments. When defining whether or not a game as a whole is a dark game, you can’t use specific examples to prove it. It’s always going to be a question of the game overall, and whether or not it manages to balance out the dark parts of the story. One of the aspects where Majora’s Mask can get a bit darker than the average Zelda game is all the hardships of the people of Termina, and how they suffer under the Skull Kid’s cruelty. Unlike the majority of characters that need your help in other Zelda games, the people of Majora’s Mask are often truly suffering; they’re not simply beset by minor troubles. The paranormal researcher and his daughter Pamela in Ikana Village are the most obvious example, but Anju and Kafei, Gorman, Cremia and Romani, the Indigo-Gos, and other characters also fall under this. 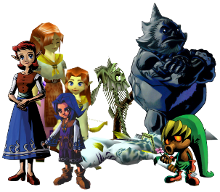 The suffering of the people in Majora’s Mask is also more pronounced because of the nature of the game, and how it covers all the characters almost equally, showing details about their lives and how everything affects them. Majora’s Mask deals with everything on a personal level; everyone matters to the player. As I said, though, most games have dark moments. While Majora’s Mask may make these parts more severe in some cases, there are other aspects to this that balance it out and make it not as dark as it seems at first. And really, the reason that these hardships are not so dark is pretty much the same reason that they are dark: It’s personal. Yes, you see the suffering in much greater detail, but it’s also presented in a way to really matter to the player. More so than in any other Zelda game, you’re made to really care about the people of Termina, and that trait is prevalent not only in the player/NPC interactions, but in the ones between NPCs as well. Most of the time the characters have some connection to one another and really do care. In some cases this isn’t explicitly demonstrated, but is stated (like Gorman when you play the Ballad of the Windfish for him in the Milk Bar), and other times it is directly reflected in characters’ actions, like with Pamela taking care of her father or the Curiosity Shop man helping Kafei. And, also because the nature of the NPC interaction is personal in the game, so too are all the moments where you help the people. In most Zelda games, helping someone is really just the end of a sidequest. You might have some entertaining dialogue, but for the most part it’s about progression or rewards. In Majora’s Mask, virtually every sidequest is punctuated not only by heartfelt thanks, but by detailed dialogue that details aspects of the character, how they live, and how things affect them. And, because the Time Cycle gives you so many different ways to interact with or observe the characters at different times, those details have weight. All the characters are helped in a very serious way, and this is the counterbalancing element to the darkness of the suffering; people are helped, and afterwards, regardless of the hardships they’ve been through, they are okay. The ending of the game, provided you collected all the masks, stresses this, as it shows all of Termina celebrating and free of their curses and troubles. Majora’s Mask is about release from suffering easily as much as it is about the suffering itself, and given that the natural progression of the game (and indeed, any Zelda game) is to help these people, their actual suffering is somewhat inconsequential compared to its inevitable end. 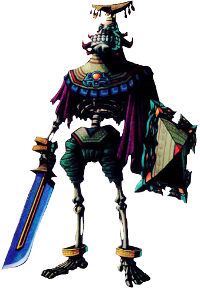 While not the primary, driving focus of the story or the message of the game, death is a theme carried pretty strongly throughout Majora’s Mask. Many of the characters are ghosts. The dancing ghost Kamaro comes to mind, but a better example would be all of the people who Link acquires transformation masks from. Darmani, Mikau, and the theorized involvement of the Deku Butler’s son. Better yet, the game has not only a dungeon and area with death as their theme, but an entire region with multiple areas and two dungeons: Ikana. But Majora’s Mask doesn’t deal with this theme in a simplistic, dark way either. Yes, people dying is a bad thing and it’s dark to see a game with so many dead, but there’s far more going on with this theme in Majora’s Mask. The most prominent and easiest example is the mask characters, more specifically the dreamlike sequences that come with each session of the Song of Healing and the circumstances surrounding them. This is also an issue of themes that balance out the dark parts. The mask characters and the curses relating to them are pretty horrific. Darmani is a ghost who died with his duty unfulfilled, Mikau is found dying of injuries in a nearly identical situation. The Deku Mask was created from a curse afflicted on Link by the Skull Kid, and even the paranormal researcher goes through something similar. But the fact is that these people are helped and their situations are resolved, in a way much like the people of the game in general. The dreamlike sequences that go with each of these moments are a crucial example of the game’s spiritual take on death. Playing the Song of Healing soothes and heals. For Link and the paranormal researcher, it lifts their curse, and for Darmani and Mikau it soothes their souls and allows them to pass on. They witness acceptance of their actions and happiness of their loves ones in these dreams, before leaving things to Link, and Link carries out their unfulfilled duties and saves their regions. Ikana is another example of dealing with death in an unusual way. Unlike most games, there’s an entire undead region. Also unlike most games, the undead are treated not merely as foes but as an entire race. Each Stalchild encountered is a person of Ikana who lived long ago; not all of them are hostile and even the ones that are can be befriended. Skull Keeta, Flat and Sharp, Igos and his Stalfos lackeys… these are all examples of undead characters in Ikana who are eventually friendly to Link. 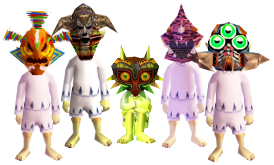 Majora’s Mask is the first game in the series where the undead are not just monsters, but actually people. They become friendly, humorous characters. This isn’t dark. It’s true that many aspects of the undead in Ikana are actually a product of the curse of Stone Tower, as I explained here, but even with that in mind, the game makes clear that these characters persist even after the curse is lifted, because even after Link completes Stone Tower and purges Ikana of the curse, you witness the ghosts of Igos and his knights in the credits. 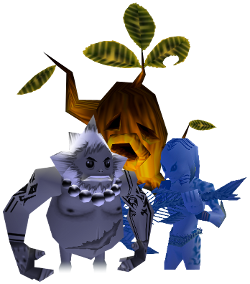 Like the rest of Termina, the undead people of Ikana are okay. Majora’s Mask, unlike many other games (including those outside of the Zelda series), doesn’t deal with death as a force of evil, as something that follows the badguy and represents his power, and not just as a bad thing that, while inevitable, is a terrible and sad thing. Majora’s Mask approaches death as something spiritual. It shows the beautiful side of death: Peace, passing on, resolving your time on earth. It’s a game where death isn’t only ugliness, where death doesn’t have to be bad, because Link and the people of Termina don’t let it. It’s about overcoming death, about making the best out of it. This isn’t a perspective most stories are willing to take when discussing death, and just saying that the death in Majora’s Mask is “dark” oversimplifies this aspect, downplaying the beauty of it. I think the beauty of how death is resolved in the game, and the lightness in which many of the undead characters are shown — particularly those of the Ikana region — prevents death from making the game dark. With the two key elements that people cite as reasons the game is dark out of the way, I’d like to discuss the other themes present throughout Majora’s Mask’s story. We covered suffering and death, and I have explained why I do not believe they are presented in a dark way. But there are other themes in Majora’s Mask as well, many of which are not dark at all, even when only considered by themselves. The kingdom being ruined and us left in this state… Isn’t it petty, little battles like this that have caused it? Believing in your friends and embracing that belief by forgiving failure… These feelings have vanished from our hearts. Friendship is the core theme of the game. Secondary to it is love in general, and helping others. The Bombers Secret Society of Justice is a group of children who are extremely significant in the game’s opening portions and through Link’s membership still play a role throughout the rest of the game during sidequests. These children help people, and it’s as one of them that Link is doing the same. I already discussed how helping people is a huge aspect of the game and why it isn’t dark, but that fact is made more apparent with how much attention the game itself puts on it. Your friends… What kind of… people are they? I wonder… Do these people… think of you… as a friend? The right thing…what is it? I wonder…if you do the right thing…does it make…everybody…happy? What makes you happy? I wonder…what makes you happy…does it make…others happy, too? Despite all the darkness in the game, it makes a huge deal out of the good things. Friendship, love, caring, solutions. These things are driving themes of the story. The whole game you have the moon hanging over your head; people talk all the time about how the game is dark because of the doomsday scenario. But it’s because of the doomsday scenario that such a driving force of the game is hope, and faith. Belief in friends, belief that things will turn out okay. Because Majora’s Mask emphasizes people being helped and the good aspects of everything, it also emphasizes hope. Anju, one of the most significant characters in the game, eventually says she has faith in Kafei. So in closing… Majora’s Mask can be mistaken as a dark game if you only look at it on paper, examining very specific instances of bad things happening in the game. But as I have said, you cannot claim the game is dark because of individual moments, because there are dark moments in nearly any story. Majora’s Mask, when looking at the big picture, is not a dark game. I have never thought that it was, even during my first playthrough. Dark in just the right ways but balanced out by so much hope and happiness. It deals with its darkness and achieves a balanced presentation by implementing humor and beauty and happiness into everything. This was my experience with Majora’s Mask. Axle has been on Zelda Dungeon for several years and runs the site’s video mailbag, the Curiosity Shop, and also does other videos on the site’s YouTube channel regularly. He frequently writes articles and can also be found on Twitter, Facebook, deviantART, and his own personal YouTube channel.